As we transition to August, we are suddenly reminded of the calories we've consumed all summer long. Vacations, parties and warmer weather have a way of getting the best of us and our eating habits. Here at the Uptown, it's been a summer of meat. From the aged strips to the pork filet and even the Father's Day barbeque trio... we've tried it all. Whether you still haven't got enough of our meaty dishes or are ready to transition to lighter meals, stop down today and you'll find something for everyone. 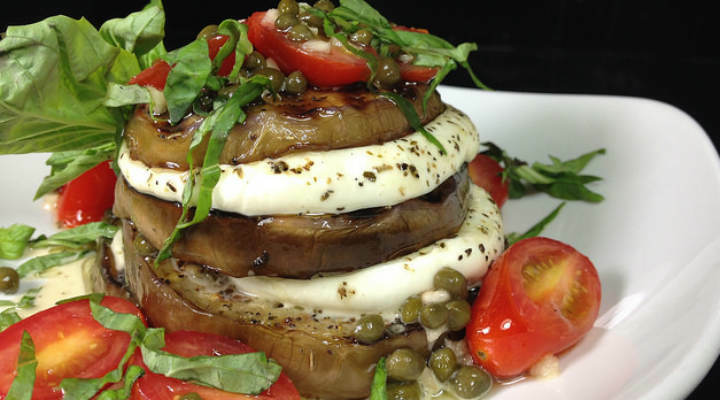 For the appetizer lovers of the world, we created a tri-level dish layered with grilled and marinated eggplant and mozzarella cheese. Enough to share, the dish is served Italian style. In addition to perfect amounts of fresh mozzarella cheese, Chef Chris also sprinkles in grape tomatoes, capers and basil. 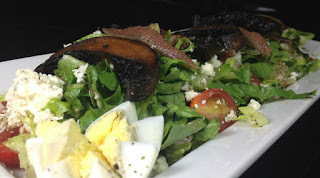 If a salad starter is more to your liking, we've added a new grilled portabello salad. Served on romaine lettuce, this salad has seared portabello mushrooms, white anchovies, gorgonzola cheese, and grape tomatoes. We drizzle extra virgin olive oil and balsamic dressing over the the top to finish it off. We realize that sometimes a light salad or a late-night snack is all you have time for during the busy end of summer. As school starts back up and you go back to your routines of sports, homework, school supply shopping and Friday night football, keep us in mind... even if it is for your late-night dinner on the go! Stop down for a quick drink while we get your mess-free meal ready for you in just 10-15 minutes... the perfect amount of time for a quick glass of wine or an ice-cold beer as you head off to the next destination in your busy schedule!